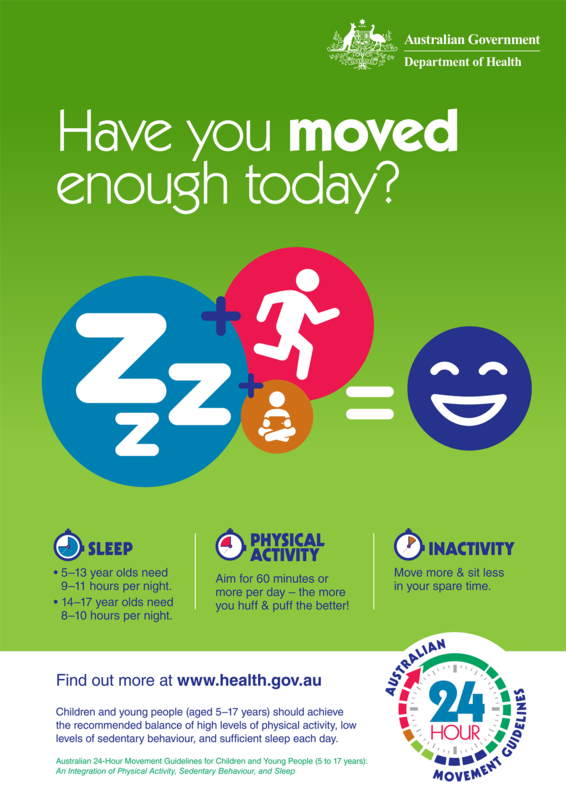 The 24-Hour Movement Guidelines include a suggested picture of what a day for a child or adolescent should look like, including time for physical activity, limiting sedentary activities and getting adequate sleep. The new Guidelines use a 24-hour integrated approach, where physical activity, sedentary behaviour, and sleep – which is the new component – need to be considered in relation to each other when examining their associations with health and development in children and young people. Sleep plays an essential role in a child or adolescent’s growth and development and shares an interrelated relationship with physical activity - if children are well-rested they will have more energy to be more active and the more active they are the better their quality of sleep. Or head to the Department of Health for guidelines for all Australians.